November is almost over, and with it, this thing called NaNoWriMo . . . which is actually called National Novel Writing Month . . . which should ACTUALLY be called International Novel Writing Month . . . which would be InNoWriMo…. I have derailed. Let me start again. November is almost over and so is that thing I’ve been doing. What have I been doing? Writing a novel. Or, specifically, working towards 50,000 words of a novel, which is the goal of NaNoWriMo. Believe it or not, I WON! Won = reached 50k words before Dec. 1. A few years ago, I wrote my longest piece of fiction ever. It clocked in at ALMOST 8,000 words. That’s it. And I worked about a week on it. But this November, I cranked out over 52,000 words! And not just words, but most of them are really good, I think. Heck, you’d probably even recognize most of them. I’ve seen them many other places and I bet you have too. All kidding aside, I’m really happy and proud of my story. During the writing process, I have actually teared up twice from the story. There are some really sad parts. But I promise to those of you who will one day read it, there are happy parts too. Anyway, the point I was trying to make is, I’d like to sell my novel. And the books to follow, because I realized early on that this was going to be, if not a series, at least two books. Do I expect to make Stephen King-money? No. Do I expect to make $5. Yes. I am certain I will make $5, even if I have to ask my Dad to buy it. Whether I go the traditional publishing route or the self-publishing Kindle, Nook, PDF, route I don’t know. But I do know it’s a damn good story and I’m a damn good . . . above-mediocre writer. But I’m not done. November is winding down, and although I’ve passed 50k (is it 50k or 50K? ), I’ve still got quite a bit to write. The way the story is outlined, I feel it will clock in around 85-90,000 words. So here’s my request for you guys: stay on me about this! Ask me what my word count is. Ask me how the story is coming along. Indulge me if I keep shouting out my word count. Because soon this will all be over and I’ll start editing, which I promise will be done in the closet. No shouting there. This year, I’m participating in NaNoWriMo for the first time. 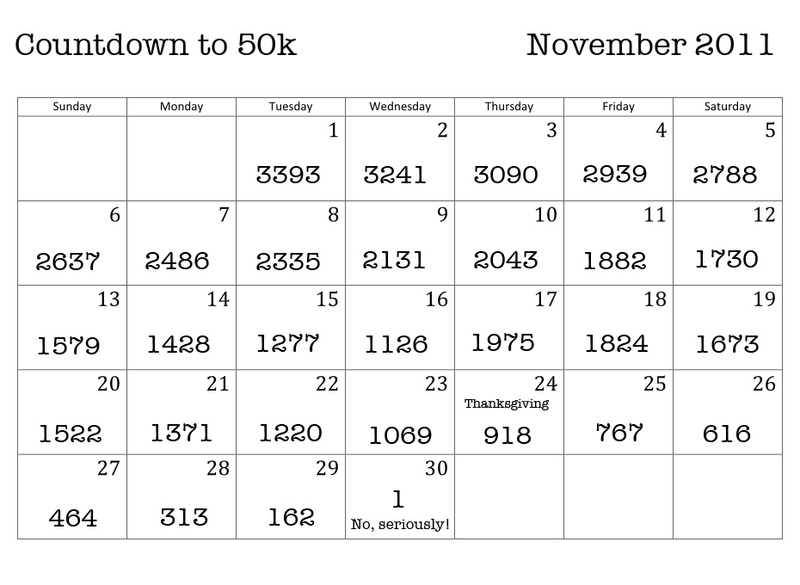 Simply, the goal is to start a new novel and write 50,000 words, all from November 1-30. Thirty days to write fifty thousand words. The idea behind the challenge is to just keep writing and get to the end. The emphasis is on quantity because so many writers never finish novels because they are always editing as they go. They forget that even if they write and finish a crappy first draft, they’ll still have a whole book! Nowadays, 50k words isn’t really a whole book, though. Back in the day, The Great Gatsby clocked in at like 50,061, but now books tend to shoot more around the 100,000 mark, plus or minus fifteen thousand. But, for those like me, who have only written short stories, 50k is plenty to aim for, even if the book isn’t finished by that number. Just getting to 50k in 30 days is the challenge. In order to reach 50k in 30 days, writers need a daily word count of 1,667. Most of us can write more than that a day, but the point is, that’s the minimum you need to write each day if you’re going to make it. Thanks to repeating decimals and rounding up, if you do ONLY 1,667 words each day, you’ll get 50,010 words! YAY you rose above the challenge! Like I said, this takes advantage of the great enthusiasm NaNos have come midnight, Nov. 1, but it also has some other advantages. When the month is winding down, but holiday season is winding up, the word count gets less and less. Would you rather write 1,667 words on Thanksgiving day or 918? That’s almost a 750 word difference and it comes 24 days in, when momentum may be stalling. Another advantage is that starting day 13, the word count drops below the 1,667 that is needed the other way! That’s 18 days of not fighting for 1,667. And yes, some of us do fight to get that high on word counts. Click the calendar for full size, right-click, and save!